We render our clients with a wide assortment of Bulk Fryer Pan, which is available in different models and capacities. 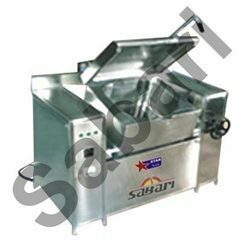 Manufactured using high grade Stainless Steel and latest technology, it is suitable for bulk frying food in an easy and convenient manner. Our range of Bulk Cooker consumes less fuel and can also be custom design to suit the varied requirements of our esteemed clients. We offer a broad range of Tilting Braising Pan, which is manufactured using stainless steel and other quality raw material. Available in capacities of 60 & 90 liters, it is extensively used for roasting, sautéing and braising of meat, rice & vegetables. In order to attain maximum satisfaction of our clients, we also provide our range of Tilting Braising Pan in customized forms. Looking for Bulk Frying Pan ?